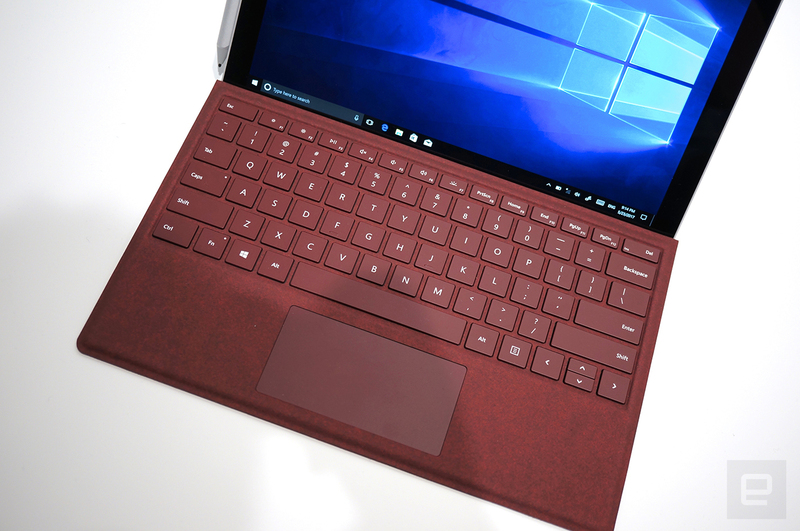 Microsoft has mostly left the Surface Pro line untouched since late 2015, but the company is finally giving it a long overdue refresh today. Announced at an event in Shanghai earlier, the new machine -- now simply dubbed Surface Pro -- packs Intel's 7th-gen Core processors (Kaby Lake; m3, i5 and i7 flavors), an enhanced 12.3-inch PixelSense display (2,736 x 1,824) plus optional LTE Advanced radio due later this year. 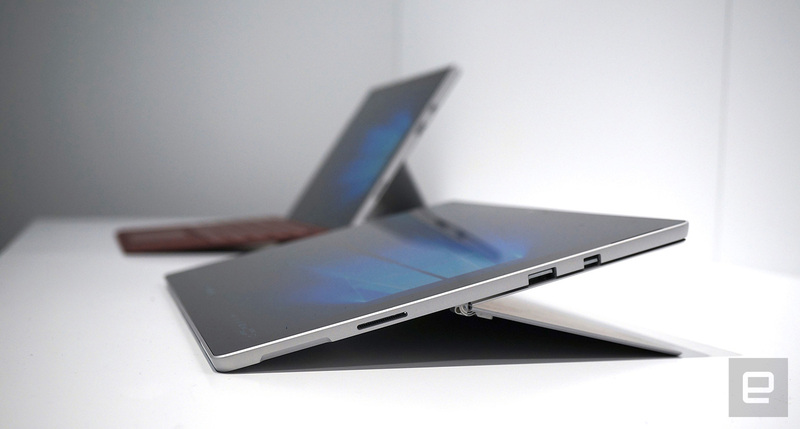 Microsoft calls this "the lightest, the best sounding, the fastest and the quietest Surface Pro ever," and the company was keen to claim that its own machine is 1.7 times faster than the iPad Pro. According to Microsoft's video playback test on the i5 model, battery life is rated at 13.5 hours, which is a notable jump from the old nine hours. Oh, and there's no longer a fan inside the m3 and i5 models, thus reducing the weight of the i5 version from 1.73 lbs to 1.7 lbs. The weight of the other two models, however, remain the same. While the machine itself -- including its lack of USB-C ports -- looks pretty much the same as before from afar, up close you'll notice the slightly rounded edges. What's also not immediately noticeable is the new hinge design: you can now push it all the way down to 165 degrees -- or "Studio Mode," as Microsoft likes to call it. Even the Surface Pen has been given a spec bump: the old 1,024-level pressure sensitivity is now at 4,096 levels, and it comes with tilt sensitivity along with a speedy 21ms latency. Sadly, the Pen is no longer bundled with any of the three models, so you'll have to fork out an extra $99 for one. Much like the recently announced Surface Laptop line, the new Surface Pro's keyboard cover is getting some Alcantara love in three colors: platinum, cobalt blue and burgundy; or you can save $30 by getting the $129 regular black keyboard cover instead. Pre-order starts today at $799 and up, with specs starting from 128GB SSD plus 4GB RAM all the way up to 1TB SSD plus 16GB RAM, and it's shipping in mid-June. This mid-cycle update was expected after Surface chief Panos Panay said that a Surface Pro 5 wouldn't appear until there's "an experiential change that makes a huge difference in product line." Even then, this new Surface Pro does manage to pack a few surprises, so it should keep us entertained for the time being. And if that doesn't scratch the itch, you could just buy one of the many alternatives from other hardware makers.